The chapter aims to do two things: 1) a rigorous presentation of philosophy of African logic and 2) to do this from the perspective of Ezumezu (an African) logic. The chapter will proceed by defining the three aspects of Ezumezu logic namely: 1) as a formal system, 2) as methodology, and 3) as a philosophy of African logic. 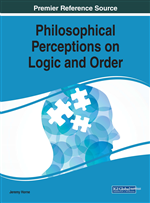 My inquiry in this work primarily is with the philosophy of African logic but it will also cut across formal logic and methodology in addition. In the first section, I will attempt to show how the cultural influence behind the formulation of the principles of African logic justifies such a system as relative on the one hand, and how the cross-cultural applications justify it as universal on the other. I believe that this is where African philosophical assessment of African logic ought to begin because most critics of the idea of African logic agitate that an African system of logic, if it is ever possible, must necessarily lack the tincture of universal applicability. Afterwards, I will narrow my inquiry down to the African philosophy appraisal of African logic with an example of Ezumezu system. This focus is especially critical because it purveys a demonstration of a prototype system of an African logic. In the section on some principles of Ezumezu logic, I will attempt to accomplish the set goal of this chapter by presenting and discussing some principles of Ezumezu logic which I had formulated in earlier works in addition to formulating a few additional ones. The interesting thing to note here is that these principles are/will all (be) articulated from the African background ontology. I will conclude by throwing further light on the merits, nature and promises of an African logic tradition. As the spectre of globalization closes in on all cultures and on all ends of the world, cultures will move from the understanding of how much they shared in common and come to discover how much differences lay between and among them. It is unavoidable that at the highest realization of cultural bonding there would emerge a curious search for identity among bonding cultures. This great quest would be led by cultures who feel their identities are not present in the globalized scheme—who only then come to realize that the globalized scheme is nothing but the thought system of a determinate culture imposed on the rest of mass of humankind. It is also at this stage that it would come to light that classical logic is neither an absolute instrument for thought nor the only logic possible—that it is truly a Western formulated logic! Evidently, the discovery of relative logics would herald a shift in thought leading from a globalized world where one thought system binds all cultures, to a glocalized world where relative but universalizable thought systems form a complementary amalgam. It is in the midst of this seeming complexity that humankind may realize the importance of tolerance and inclusion. Both the “self” and the “other” may attain not only the clear perception on their common bonds or their differences thereof but more importantly, they may attain for the first time, in its clear light, the validity of disparate thought systems. The polar between the self and the other, it is safe to argue is sustained “only” by ignorance. Indeed, how tremendously amazing humankind’s exploration of the world has been and how tremendously amazing humankind’s ignorance of humankind has remained. By African logic I do not mean a border-sensitive, culture-bound exclusive system that holds only in Africa and is not universally applicable. By logic tradition in Africa I do not mean in its simplistic form, the applicability or observance of classical two-valued logic in African thought as the only universal logic. By African logic or logic tradition in Africa, two terms I use synonymously, I mean the logic formulated to capture the African system of thought based elementarily on the extension of classical two-value logic which is universal. It is not border-sensitive, exclusive or unconnected with the universal idea of logic and it contains elements of both the indigenous thought and the universal thought in that the classical two-valued logic is its foundation but it transcends it to a variant of three-valued logic. In the Ezumezu1 prototype, the three values are the two sub-contrary values, called ezu and izu or true and false which are treated as fragmented halves of the whole called ezumezu written with small letter ‘e’. Possibly, one challenge which a scholar trained in Western philosophy and classical logic will encounter in reading this work will be a struggle to make sense of my discussions within the Western logical schema. This is because, such a scholar will be constrained by the paradigm of Western philosophy and logic he/she is familiar with. But the truth is that if my presentation here can be realized straight-forwardly within the paradigm of Western philosophy and logic, then it would not really qualify as a discourse in African philosophy of logic. To be worth its name therefore, my discussions here have to generate a few controversies to one encountering the African thought system for the first time when such a person assesses it with the tool of Western logic. Let me begin with some elementary conceptualizations.